Most people choose Bermuda for their destination wedding but R and H decided on doing something a little different. When R called my last Christmas she described a simple family affair at a rustic location. 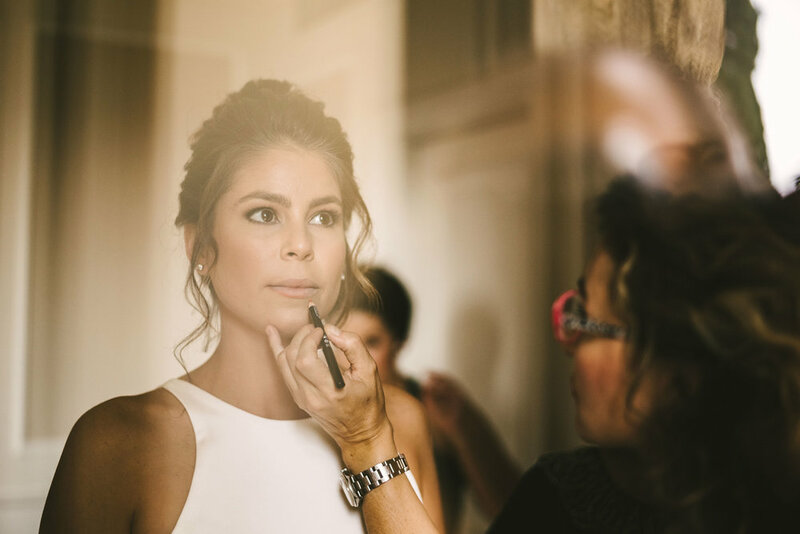 However, as the months progressed and more guests accepted the invitation to escape Bermuda for the fall weather in Tuscany, their wedding developed into the social event of the island…just on a different continent. 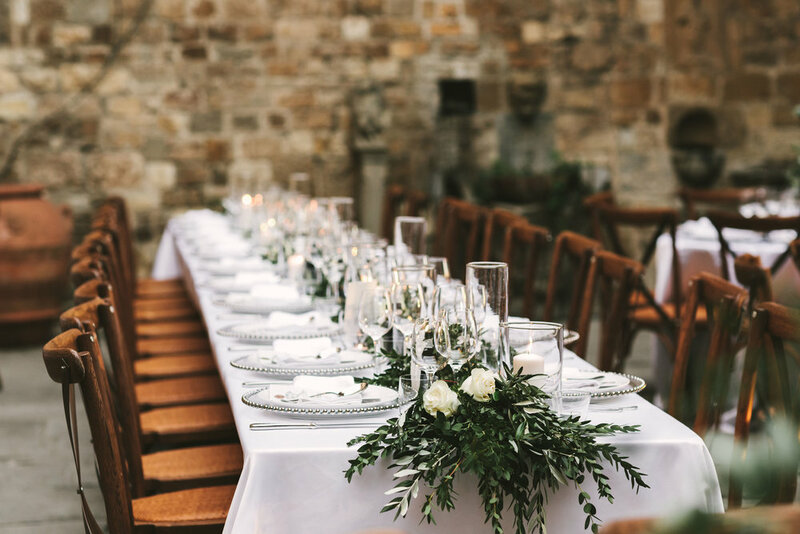 Every wedding planner dreams of planning a wedding at Castello di Vincigliata. It is literally out of a storybook…you me even see briar rose turning the corner or Cinderella running down the stairs. 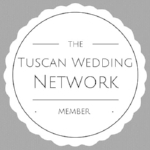 It is a stunning venue nestled into the hilltops above Florence. The castle was built for entertaining by the Englishman, John Temple Leader during the mid 1800s on the remains of an ancient tower so it is no surprise that it is one of the most chosen venues in the Tuscany area. The castle has a back winter garden, a front terrace overlooking the city, sunken garden, stunning courtyard and is encircled by vineyards and olive orchards. The famous wine label, Bibi Graetz grows his fruits on the land. This is a must pick for any bride or groom looking for a classy statement on their wedding day. R’s dress was like the castle. You have a stunning beginning to work with and then everything else should accent it. She chose a simple but very elegant satin halter dress with a train and strappy criss cross back by BHLDN. She complemented the look with a comfy pair of black velvet Come Shun shoes and diamond tear drop earrings. Her messy bun and simple yet elegant make-up by Pamela Leti had a very old Hollywood glam style to it. The groom wore a black suit with hunter green bow ties by Portabella suits. He accented the suit with a white and green buttonhole, a hunter green pocket square and brown leather belt. 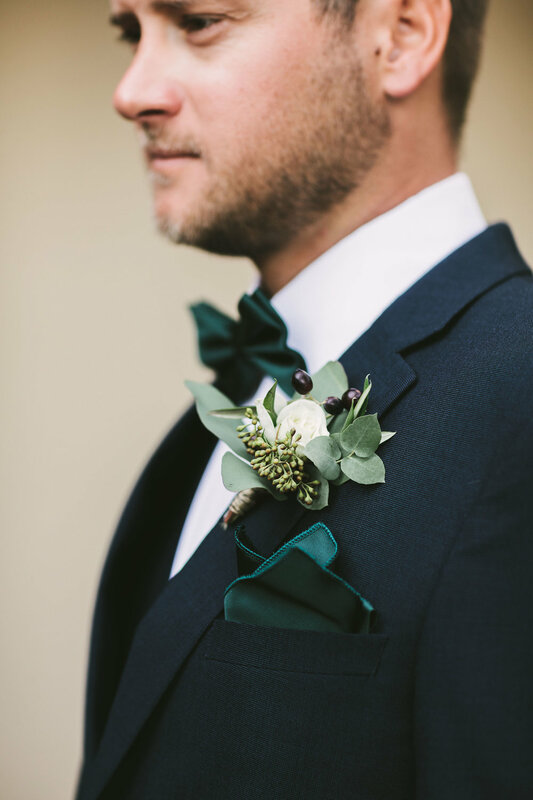 The buttonhole had ornamental berries, olive branches and small white roses. Just like Italian cooking, beauty is in the simple quality of great materials. We used organic and simple tones on hand pressed paper and vellum. I’ve always adored velum, it gives you a peak into something even more exciting. R an H chose white and hunter green for their colours. Vincigliata is already a stunning venue but needs a special hand to take its rustic flare and make it super chic. We decided to do the same with the stationary, focusing on the natural tone of the hand pressed paper and the simple elegance of herbs used in Italian cooking, such as rosemary and sage. The look was topped off with a laurel leaf wax stamp and a stamp with the couples initials. The addresses were hand written with a quill pen and simple black ink. The Wedding party wore chiffon hunter green gowns from David’s bridal. I love chiffon and it’s movement in the wind. The gowns had a slight slit up the right leg that showed when the girls whisked down the aisle. The girls wore matching diamond teardrop earrings and carried smaller versions of the bridal bouquet. There hair was in a messy chignon. The bride’s niece was the flower girl with a tulle skirt and green sash. Her adorable hair was crowned with a baby’s breath wreath. The groomsmen had the party started from the time they arrived in Florence. All of them have nicknames related to something fishy—- I guess it’s a Bermuda thing. H lovingly showed me the time he caught the largest marlin I had ever seen in my life on his youtube channel…so maybe I can see where the fishy nicknames come from. One of his groomsmen…I think Chum…told me multiple times that he only drank rum. Even during the pre-wedding lunch overlooking Florence with fine Brunello red wine…he ordered rum. These characters kept things interesting. I passed by Villa di Fiesole to check on the wedding party as they were dressing outside of their room in black Portabella suites with hunter green bow ties and hunter green pockets squares. R and H decided on a civil ceremony at Castello di Vincigliata. The ceremony was held on the front terrace. They chose natural wood cross back chairs an a stunning organic flower arch done by my friends at Violamalva. As R pulled up with her dad I scurried the groomsmen into place and rushed H to the front of the aisle. R who is normally a very relaxed person started to feel the intensity of what was about to happen and broke into tears. Emotions were high, but we started the bridal procession. The look on H’s face when he saw R coming around the corner was priceless. During the ceremony bridesmaids and groomsmen told stories and read poetry. It was truly very beautiful, and simple. H’s kiss to R was probably my favourite moment of the entire day. He literally grabbed her and kissed her as hard as he could in excitement. It was really sweet. After the ceremony the couple went around the castle to take pictures. Their guests enjoyed a cocktail and canapés made with organic and seasonal ingredients by Zenzero Biocatering from Florence. After the cocktail the couple sat down for a 3 course dinner with pumpkin soup, saltimbocca, salad, and other delicious treats. The tables were elegantly dressed with white linen tablecloths and napkins. The white Ginori plates were set on top of glass chargers with silver utensils. Each table was decorated with greenery and candles. The courtyard was lit with glass bulbed bistro lighting, uplighting and torches by Alma Project. Guests found their seats according to Bermudian Parishes. The menu was vellum with a botanical print underneath, and kept together with a wax seal of the couple’s initials. I always love to hear the '“oooooh and the aaaah” when people turn the corner and see the dinner area for the first time. After dinner the couple had a dessert bar with local treats. Originally R and H didn’t want a cake…but I convinced them otherwise. Since they already had a dessert bar they decided on a small cake by Marisa Vitali at Sugar Cups Greve. It was a simple chocolate cake with butter cream frosting. 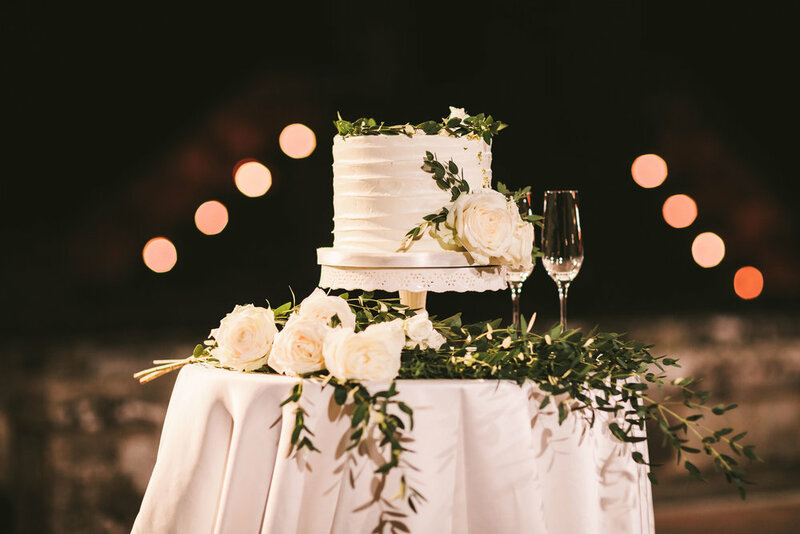 Marisa and I used eucalyptus branches and white roses to decorate the cake. Leila at Zenzero set up a cute table along with some eucalyptus and olive branches. When the couple made their first cut fireworks lit up the sky. Afterwards the couple danced the night away.